Dan Blank is definitely a name worth remembering, as this young filmmaker has been creating some of the most awesome and intriguing short-films of late. His latest short, Monster Roll is testament to his limitless ambition and his tenacious attitude to go beyond the mundane. 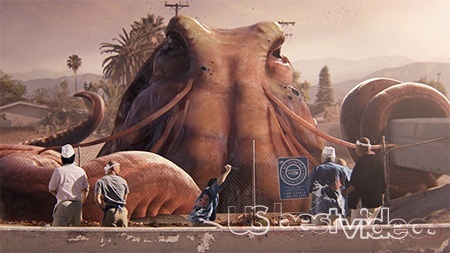 The short goes about a team of sushi chefs that wage war against giant sea creatures. Yep you read that right, its sounds absurd and it certainly is, however it certainly is good. Current plans are for Blank to package the short in hopes of turning it into a feature film, "we sorely miss the tone of those big, fun fantasy movies we grew up with–movies like Ghostbusters, Gremlins, and Big Trouble in Little China,” Blank said. “We also want to continue the tradition of more recent movies like The Host and District 9 where strong story, characters, and humor take priority over expensive VFX sequences." This has to be one of my favorite shorts that I have seen in recent times, and even though its plays out like an extended trailer, I really hope that Blank’s vision for this incredible short is realized and that we might get to see it on the big screen sooner, rather then never. So check this out and tell your friends to do the same, and lets get a film that sure to be quite the spectacle, fun and completely awesome.